or not runny enough, but that's just being picky. 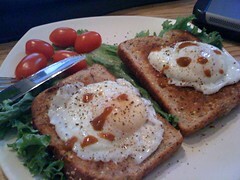 i love poached eggs but doesn't food always look so much yummier when someone else makes it!? lol. by the way, how do you make your poached eggs. i don't ever make them because i don't have a proper poacher. must one have a proper poacher to make poached eggs? i know. i'm 40 and i don't know this. it's bad. I checked youtube for vids and trial and error. I haven't used a poacher yet, just a couple inches of water in a deep fry pan or pot. The vinegar DOES help for sure, as does a good slotted spoon.